I grew up listening to this man....You don't know happiness until you've heard "Bo's Bounce" and "Mumblin Guitar"
JACKSONVILLE - Bo Diddley, a founding father of rock 'n' roll whose distinctive "shave and a haircut, two bits" rhythm and innovative guitar effects inspired legions of other musicians, died Monday after months of ill health. He was 79. The Rolling Stones' bluesy remake of that Holly song gave them their first chart single in the United States, in 1964. The following year, another British band, the Yardbirds, had a Top 20 hit in the United States with their version of "I'm a Man." 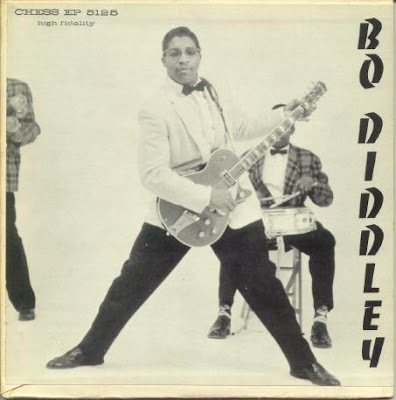 Many other artists, including the Who, Bruce Springsteen, George Michaels and Elvis Costello copied aspects of Diddley's style. Growing up, Diddley said he had no musical idols, and he wasn't entirely pleased that others drew on his innovations. "I don't like to copy anybody. Everybody tries to do what I do, update it," he said. "I don't have any idols I copied after." "I am owed. I've never got paid," he said. "A dude with a pencil is worse than a cat with a machine gun." In the early 1950s, Diddley said, disc jockeys called his type of music, "Jungle Music." It was Cleveland disc jockey Alan Freed who is credited with inventing the term "rock 'n' roll." Diddley won attention from a new generation in 1989 when he took part in the "Bo Knows" ad campaign for Nike, built around football and baseball star Bo Jackson. Commenting on Jackson's guitar skills, Bo Diddley turned to the camera and said, "He don't know Diddley." When he was 5, his family moved to Chicago, where he learned the violin at the Ebenezer Baptist Church. He learned guitar at age 10 and entertained passers-by on street corners.